*A friendly reminder that your projects for Outerwear are due TOMORROW people!!!!! And we can't wait to see all of them. There are already some absolutely amazing ones in the Flickr group....you really should check them out. Also, one more item of business, please remember that your Sew Along project needs to be something you have sewn since Christmas. We have been noticing some confusing dates on some photos on the page. And while we know that sometimes camera settings don't always show the accurate dates, would you pretty please try to update your camera dates (I know that for some technology-challenged people like myself that's not always possible....but maybe a friend could help?) Also, if you have already uploaded something that shows a prior but was made recently, please leave a comment on the picture so we know to include you. We are really trying to make the Sew Along judges job a lot easier (because they have a hard enough trying to pick----all of YOUR work is a.maz.ing). So, your help would be greatly appreciated. And one more answer to a question that we have been getting. The Sew Along judges send us their top three picks: their first choice gets 3 points, their second choice gets 2 points and their third choice gets 1 point. The sew along outfit (that fits all the criteria) that has the most points----WINS! 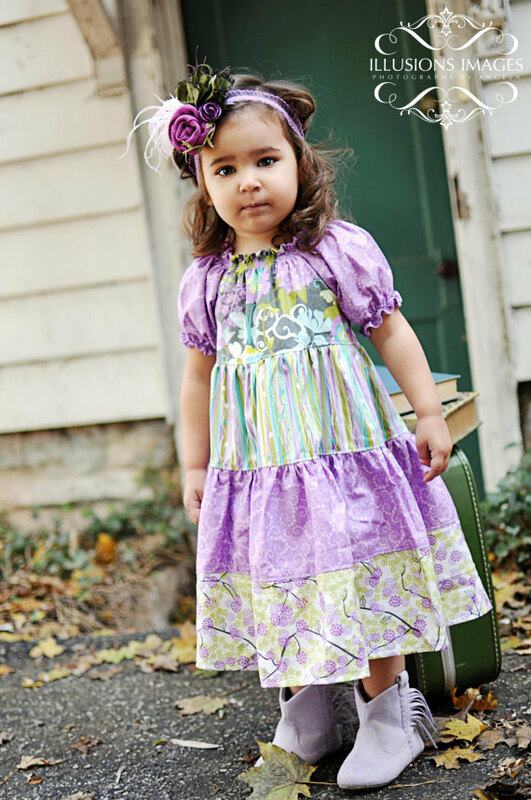 Today we have a fabulous pattern giveaway for all of you from Create Kids Couture. One of you lucky gals is going to win a 3 pattern set of Tiffany and Shannon's boutique-style patterns! So, tell us which pattern would you choose? Visit their shop, make your decision (it's going to be a tough one) and them leave it in the comments. And your name is in the hat! Good luck! oh my! Those patterns are so adorable! I love the Carolines Princess Top and the pants pattern that goes with it! So cute! So hard to choose! All of their patterns are so adorable. I'd have to say my favorite is Mia's Reverse Knot Twirly Dress. Thanks for the chance to win! So many cute patterns to choose from! I think my favorites are the princess top and pants patterns! I like the princess top and pants. That outfit might just make my daughter reconsider her "I only wear dresses" policy! All too cute. I like Elena's Twirly Peasant Dress. I think my daughter would love to twirl in it! shirred peasant top and dress - tons were so cute! 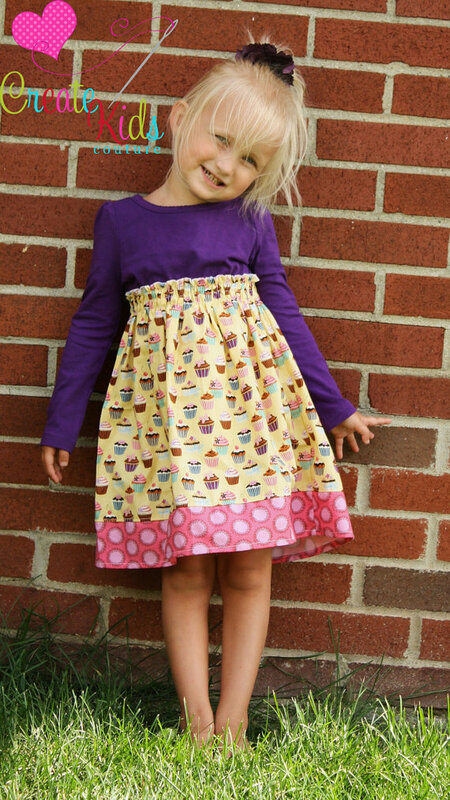 My four year old daughter would LOVE this dress and I would love to make it for her! The "Trinity's Tiered Twirly Dress" is calling ehr name!! Thanks you! I love Lola's Tiered Twirly Dress. It would look adorable on my granddaughter. I love Blair's Bustled Knot dress. They are all so wonderful! The Sophia dress is great! My favorite is Sophia's Open Back Ruffled Dress. I would love this one for my daughter. I love Jewel's Stripwork Dress! I have had this pinned for months! Anika's ruffle capris are my favorite but they all are so sweet! These are too cute! I like Blair's Bustled Knot Dress. Oh how exciting! I'd love this one: 2 Pattern Pack Kiki's Extra Ruffle Top and Kara's Triple Ruffle Pants. And this one: (well you said to just pick one didn't you?) lol. I think I like Stella's sassy peasant dress the best. So cute! I like Marissa's perfect peasant dress pattern. love the tasha's tshirt dress pattern - looks like a comfy everyday kind of dress and the reverse knot dress is very cute! I found a lot that I like, but I do like this one a lot! I like the bustle dress (but I also really like the reverse knot twirly dress!) They're all adorable though. Definitely adding her shop to my favorites. LOVE the tiered twirley dress. I am a foster parent of young girls and this would fit all body types! When I make something I love it when more than one child can wear it. I've been wanting a really cute romper pattern for a while now, so I would definitely pick Autumn's Peasant Romper and Anika's Ruffle Capri Romper patterns. Thanks! I love Marissa's perfect peasant dress. Too cute, I love the little apron! I love them all! The Mia's Reverse Knot Twirly Dress is dang cute though! I love the Elena's Twirly Peasant Dress! Very cute! I have so many of these patterns on my wish list! Right now, it's a toss up between Vivian's peasant top, and Marissa's perfect peasant dress--I love the real apron on the Marissa....SO CUTE! I just pinned Kiki's Extra Ruffled Top last week on Pinterest!!! Such cute designs. Mia's Reverse Knot Twirly Dress & Sophia's Open Back Ruffled Dress are also too cute for words! So many to choose from my favorite is the Meridith's Center Ruffle Dress. I really like the ruffle romper or Jewel's stripework dress! Actually with three girls I love them all!! I already own my favorite one... Sophia's Open Back Ruffle Dress. My next favorite is Shasta's Skirt Wrap and Apron Set PDF Pattern. Thanks for the chance to enter! Love the sassy peasant dress! I'd probably pick Katy's Double Layer Ruffle Bodice. It's cute! I like Mia's Reverse Knot Twirly Dress. Oh my goodness!!!! It is way to hard to choose a favorite with all that ruffle-y goodness. I think I would choose Sophia's Open Back Ruffle Dress, but I'm sure that's going to change many many times! Merideth's Ruffle Dress is just adorable. Beautiful patterns. Mia's Reverse Knot Twirly Dress is super cute! It is hard to just choose one but the Mia's Reverse Knot Twirly Dress PDF Pattern is one of my top choices!! i would chose mia's reverse knot twirly! because want little girl doesn't want a dress that twirls?!?! I like Meredith's ruffle front dress and top. Too cute! Okay, I NEED the open back ruffle dress!~ I need it. These patterns are so cute. I love Chloe's Peasant Party Dress. I love the peasant ruffle dress! I love Anika's Ruffle Capri Romper and many others!! I like Mia's Reverse Knot Twirly Dress. They are all cute, though! I really like the Jewel's Stripwork Dress. They are all so cute! The lola twirly dress is adorable, I love the neckline on Trinity's tiered twirly dress, and I love Gaby's side ruffled capris! I love LOVE the peasant top with sash... and the Stripwork Dresses! Everything is so cute! I love Trinity's Tiered Twirly dress :) They are all so cute. Blair's Bustled Knot dress. Too cute! I like the Marissa's Perfect Peasant Dress! I love the Elena's twirly peasant! I think that I would like the peasant romper now :). Love their beautiful patterns! I love Josie's ruffle fabric peasant dress. All of them are super cute though. Tough choice :-). I love Create Kids Couture patterns! Blair's Bustle Knot Dress is just so adorable. I love the reverse knot twirly dress! So cute! Love the Jewel's Stripwork Peasant dress, Mia's Reverse Knot Twrily dress an Cienna's Stripwork Pants. Your patterns are wonderful. Hope everyone gives them a try. LOVE Create Kids Couture!! 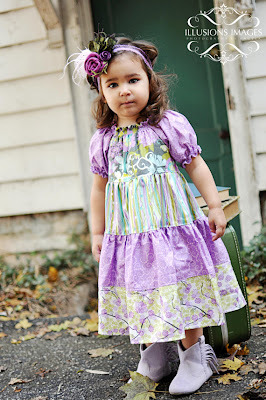 I've been here before, but Create Kids Couture sent me back for a look. Next on my list of patterns from them is Shasta's Skirt Wrap and Apron. All the patterns are so cute I have a hard time picking! !